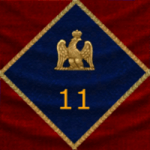 11ème Régiment de Hussards is an EU based light cavalry-hussar regiment that aims to provide a hilarious environment for its players, aswell as teaching them a thing or two about the glorious history that is Napoleonic warfare. Seasoned by countless battles and the horde of barbarians at our very gates, we welcome any challenge with great joy, for it is when we are truly challenged we perform. We are always ready to defend, and project, our Emperors' will! 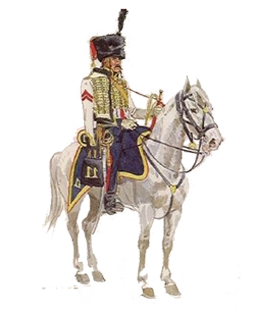 The 11th Hussars Regiment is raised by order of 28 July 1793 from the Light Cuirassiers Corps of the Germanic Legion, reinforced by the 2nd Hussars Corps of Freedom and by the Republican Horsemen Corps. The regiment takes part in the campaigns of 1793-1795 in the Armies of the West, where it distinguishes itself at Challans, of the Rhine and of the Eastern-Pyrenees, of 1796-1797 in the Army of Rhin-et-Moselle, where it distinguishes itself at Biberach. Replenished during 1797, he then takes part in the campaigns of 1798-1800 in the Armies of Helvetia and of Italy. The 11th Hussars Regiment is converted to 29e Régiment de Dragons during the reorganization of 1803. Following the annexation of Holland by France in 1810, the 2nd Dutch Hussars Regiment is incorporated in French Army as its 11th Hussars Regiment by order of 18 August 1810.The regiment leaves Spain to be reorganized and replenished in its depot of Arras and joins then the Grand Army to take part in the campaigns of 1812 in the 1st Corps and of 1813 and 1814 in the 2nd Cavalry Corps, where he distinguishes itself at Hanau. 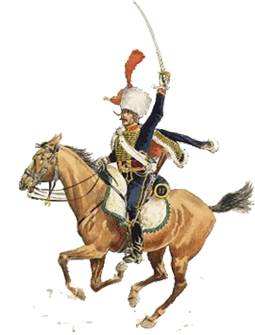 The 11th Hussars Regiment is disbanded on 12 May 1814 and its strength transferred to the 5th Chasseurs-a-Cheval Regiment. The 11e also have regular scheduled events, we don't participate in Linebattles (for now) however we do quite a lot of 1v1's. You can see the events below. Nice thread, good luck !! Can't wait to see how you guys are going to do in the CCL. Nice looking thread!